We use only the best locally sourced fresh produce. Choice of fried, scrambled or poached egg. Help yourself to yoghurt, cereals, muesli, fresh fruit and juices. 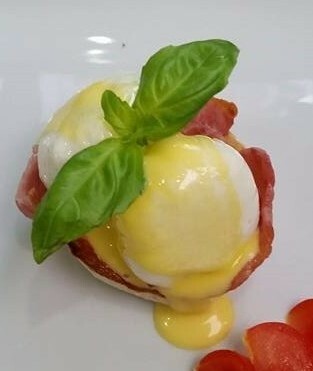 Two eggs poached to perfection served with a rasher of grilled bacon on a lightly toasted English muffin and topped with hollandaise sauce. Diana's own recipe of scrambled egg with diced sun dried tomatoes, freshly chopped basil and mozzarella cheese served on a toasted English muffin. Grilled pork and apple patty, bacon, fried egg and Monteray Jack cheese stacked high on a toasted English muffin. Swap the bacon for blanched fresh spinach for a vegetarian version of eggs benedict. We'll serve you the perfect coffee every morning from our state of the art bean to cup coffee server. Help yourself throughout the remainder of the day or evening. A selection of indian, chinese and herbal teas are also available.